We first met PETrelief when they began to care for our aged tabby, the last of a long line of felines, in his declining years, enabling us to relax when we were away from home. We continue to be very impressed with their service, their professionalism, their approachability and their sheer caring and kindness to our pets and us too!! 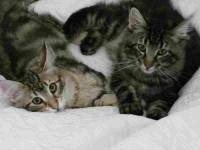 A year after his demise we obtained two Norwegian Forest cats, our first kittens for some 21 years, they bring us such joy and are so loved and we are confident of the care they receive when we hand them over to PETrelief.